It’s December 30th and I’m on my way to Dallas. I got a call yesterday from American Airlines asking if I wanted a non stop flight instead of my connecting flight … no charge. Of course I would! Changed my flight and was able to leave a few hours later. I slept in a little and leisurely finished packing. Lovely. I then went to check in online and was given the option to upgrade to business class for $130. This meant that I got dinner and checked bags would be free. So really that’s like paying an extra $100 for a far more comfortable flight. Uhhhh yeah I’ll upgrade! For a close to 4 hr flight, totally worth it! I’ve flown business class before but it’s been awhile. For any flight over an 2 hrs I think it’s worth it. You get priority boarding, and once you’re seated they will hang up your coat. The seats are far roomier which is nice. The stewardess brings you drinks (water juice etc) right away and there’s lots of room in the overhead compartments (less people per row). I just finished eating dinner, which wasn’t bad. A nice salad, veggies and roast chicken. I feel quite satisfied and didn’t fill up on crap. It’s unfortunate that this isn’t the service provided to all patrons on the flight. This little girl was boarding and while walking past me said ‘these seats look nice’. I wanted to say ‘there’s an empty seat here why don’t you stay’. But we all know that’s an impossibility. A big part of upgrading for me was getting a decent meal. Even if it did include a soft chewy chocolate chip cookie at the end :D. This is my splurge as I’ve decided that once Jan 1 2015 is here I’m going to get on track with my eating & exercising and be my FIT HEALTHY self again!! I am so grateful to have made it through to the end of 2014. It was a difficult year but it only got better. Hopefully 2015 will be even better and I will live to see the end of the next year. I am spending New Years with my lovely cousins (my sisters) and it will be wonderful. A year ago I was depressed and in pain. Had just had surgery and spent NYE watching tv. My parents stayed home with me instead of going to their friends’ NYE celebration. I love them and don’t know what I would have done without them, especially my mother. They are in India right now for 6 weeks on a well deserved vacation. We all deserve splurges and vacations. So if you don’t have anything planned, plan it! Go somewhere close or somewhere far but take a break even if it’s a short one. Take the time away from your busy schedule to enjoy life, to explore and appreciate all the wonderful things around us. 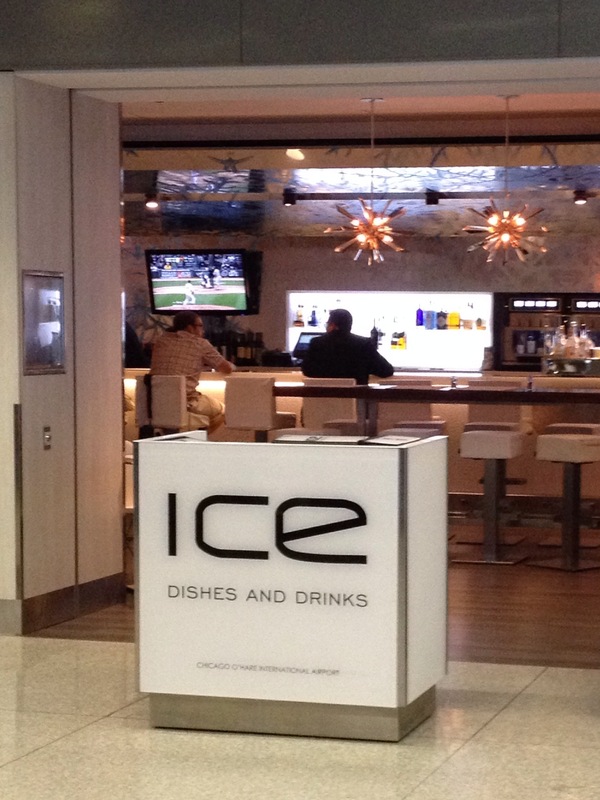 I’m now at ICE Resto/Lounge at O’hare International Airport waiting for the last leg of my flight back from San Francisco. Having dinner, since all you get are some peanuts/pretzels and juice/water on the plane. What is that?! Are they trying to end the obesity epidemic??! Anyhow, I thoroughly enjoyed my SPRING GREEN SALAD. Spring greens with cherry tomatoes, pears, almond slivers and goat cheese all topped with a lemon honey dressing. Yummmm!!! As if that wasn’t enough I also got a FRESH HERB CHICKEN SANDWICH. This was also DELICIOUS!! Romaine lettuce, mozzarella, roasted red peppers, avocado crème and of course the herbed chicken all on sourdough bread. SOOOO GOOD! I decided to splurge and get the BROWN SUGAR PECANS. Mmmmm. Yes it’s exactly what it sounds like. I realize that was a lot of food but I eat a lot more than I used to! I need all the nourishment and nutrients I can get. When it’s healthy eating and you’re active, weight gain will not be an issue. Although right now I’m trying to lose that 7 pounds I gained. Oh well, no biggie. I’ll get there eventually. I’m healthy and that’s what matters. Food is very much a focal point now LOL. I have to eat healthy but enjoying my meals is also important. Enjoying life is also important and when I was flying back from San Fran on my crazy flight with a stopover in Seattle and another in Chicago I still managed to thoroughly enjoy myself by adding in my meal at ICE. The food was great along with the ambiance and the service. The trip to San Francisco was wonderful as well! Enjoying life and savouring each day!